Judging from recent economic history, charity won’t soon be rendered obsolete. Too many people who’ve made the United States their home suffer from hunger, disease, loneliness, or neglect. Some are lucky enough to cross paths with those striving to make a difference in the lives of the less fortunate. 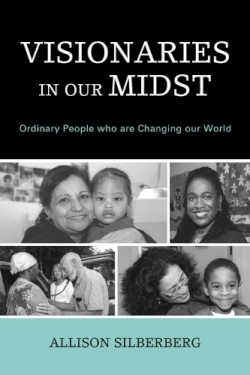 Allison Silberberg has a name for these special people in her book, Visionaries in Our Midst. Silberberg has collected the stories of eighteen charitable groups into a kind of guidebook for people looking to be inspired. We learn about Layli Miller-Muro, who founded the Tahirih Justice Center in 1997 to help “immigrant women and girls who are seeking justice in the United States from gender-based cruelty.” We meet Mary Brown, who co-founded Life Pieces to Masterpieces, which gives young men from unfortunate circumstances the opportunity to experience art and a reason to stay alive in a studio instead of dying on the streets. In addition to focusing on their current work, Silberberg includes the stories of how these visionaries were inspired to make a difference in the world. The book also includes contact information for the organizations profiled in her book as well as other, similar, groups for people who might want to give their own time or money. Silberberg occasionally allows her passion for her subjects to render her writing slightly awkward, but her storytelling style is generally easy and pleasing to read. She doesn’t hide the depth to which these people touch her and often describes her own tearful, joyful reaction to the scenes she witnesses, which adds a rich authenticity to her book. She also has a knack for finding images that embody the sense of need and the corresponding altruism she discovers in people: the sneakers hanging from electrical wires which “represent a life cut short in the streets,” or a line of patients waiting under a tree to see a doctor from a mobile medical service. These are the moments that will resonate with readers. Silberberg herself might be called a visionary; she met most of the groups in her book through the monthly fundraisers she organizes for small nonprofits. She, too, is trying her hardest to make a difference in the lives of people who have so little. She writes, “It’s about touching another’s life, connecting with another human being, being there for them.” As Silberberg reminds us, the ways in which we care for each other may be what makes our nation most great.